‘Captain Marvel’ is the first Marvel Studios film which is built around a female superhero. The movie seems dull and mundane, marked by unimaginative plotting, cut-rate villains, an insipid visual style and a lack of flamboyance in every department. Yet it is entertaining. But if it came down to a one-on-one with rival franchise DC Entertainment’s ‘Wonder Woman’, the result would not satisfy its producers. 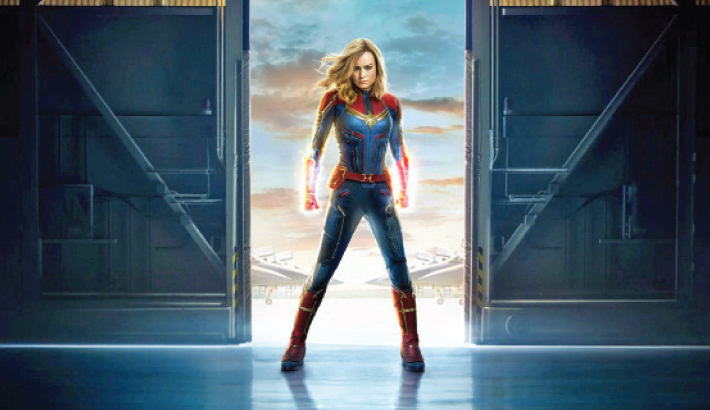 As has been widely recounted during the ramp-up to this film’s opening, the history of women in the Marvel universe is a patchy one and very much so with the ‘Captain Marvel’ character. The latter first appeared as a man in comic books in 1967 and a Ms. Marvel counterpart appeared a decade later. Danvers’ day job is with the Air Force, but much more to the point here is her gig as the eponymous warrior on behalf of Starforce, an intergalactic fighting squad committed to battling the fiendish. As things kick off somewhere in the universe, the leathered-up young woman (Brie Larson) is being tutored by her mentor, the melodiously named Yon-Rogg (Jude Law). If this much is clear, one should be grateful for small favours, as matters presently become more than murky. Perhaps we are meant to excuse this because Danvers herself is uncertain about her past, although we do see, via a flashback, that as a girl she was very keen on go-cart racing. Revealing as this may or may not be of her addiction to speed and risk, her place in the grand scheme of things remains vague just as she shuttles between the cosmic and earthbound. The film itself bounces about without any sense of logic or progression, to the point of appearing nearly chaotic. Under the direction of heretofore indie filmmakers Anna Boden and Ryan Fleck, nothing is prepared or built up to, with scenes just slapped on the screen with no less or more weight given to one over another. Nonetheless, the seeds of a potentially interesting story are here and Marvel for more than a decade now has shown that it well knows how to launch a new spinoff. Public confidence in the brand and goodwill toward this new franchise, in particular, will probably grant the movie a pass from most fans. But the characters are not dramatically introduced with any sense of interest or intrigue, the writing, dialogue and direction are pedestrian, and the visuals are sometimes muddy. ‘Captain Marvel’ seems specifically pitched toward millennial, as the action is pointedly set in the 1990s. Attention is called to assorted technology of the time, nearly all of which now looks not only antiquated, but also downright tacky. On the other hand, what does emerge as a genuine curiosity is the appearance of Samuel L. Jackson as Nick Fury, a veteran of six previous Marvel films, three times importantly and thrice in unaccredited cameos. Given the time frame, 24 years had to be shaved off Fury’s age and appearance, resulting in by far the strangest and most prominent special effect in the movie. Jackson plays a guy in his 40s, with a full head of hair. It’s simultaneously fascinating and distracting. Jackson’s skin looks almost inhumanly youthful. Still, the focus and big selling point here is ‘Captain Marvel’ herself and Larson’s impersonation of her. So what does a best actress Oscar winner bring to a performance as a Marvel superhero? Larson makes Carol (Captain) focused, solid, ever-alert to what’s going on around her, a quick learner, a determined and unafraid warrior. In other words, she is everything you would expect in a soldier, intergalactic or otherwise. But all of this is more or less prescribed by the role. What’s lacking is humour, a hint that she might get off on the action and violence, or the indication of a deep desire or spark to ferret out evil and right the world’s wrongs. The performance is fine, if not exciting or inspiring. Apart from Jackson, other actors are stuck with uninteresting roles.